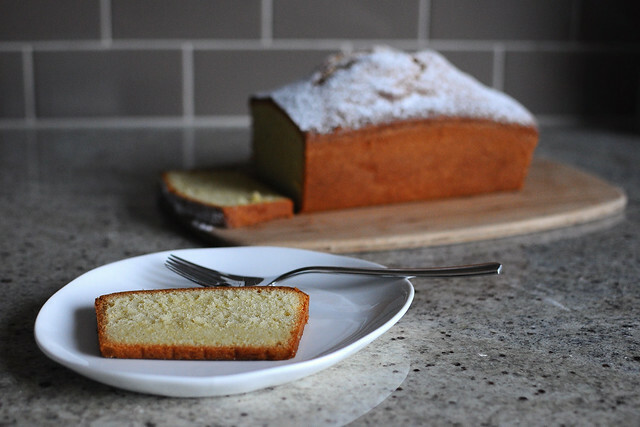 Let me introduce you to the first fully baked pound cake that I have ever made! The first two times I made pound cake, I under-baked them. Don’t ask me how that happened, but now I will only use a knife (not a toothpick) to test if a pound cake is done. Third time’s a charm, right? This version is kind of special because you use a whole vanilla bean in the batter. Vanilla beans are a total luxury ingredient in my kitchen, but I think it was worth the splurge for this cake. 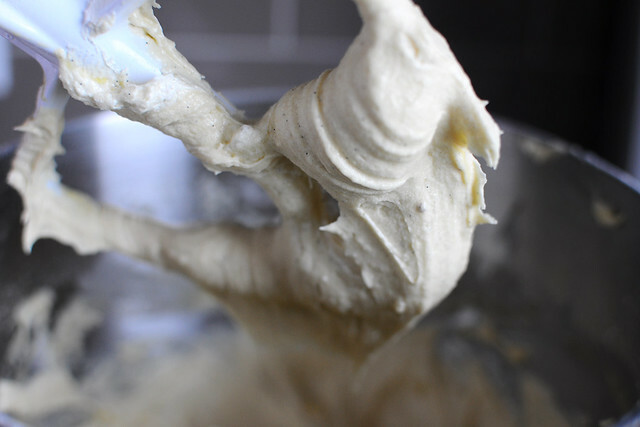 The batter is so silky and lovely. And if you look close you can see that it’s speckled with vanilla bean seeds. This cake bakes up with that characteristic crack down the center, creating that imperfectly perfect look that all good pound cakes should have. 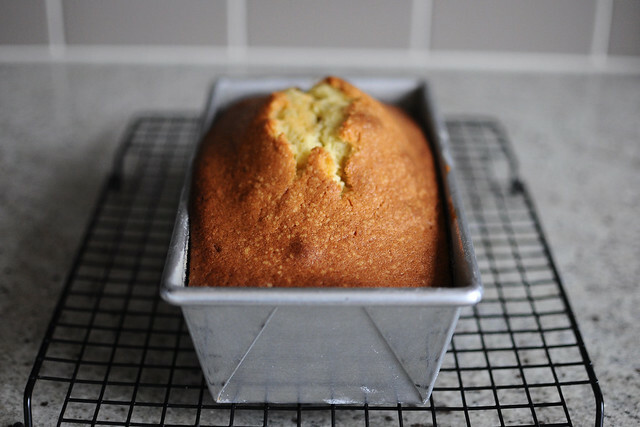 While this pound cake is good on its own, I consider it a “blank canvas” kind of cake. You can add some berries and ice cream, chocolate or caramel sauce, or even a fruit compote to turn this into an entirely different dessert. One cake and lots of possibilities–what’s not to love? Heat the oven to 325 degrees with the rack in the center and butter and flour an 8 1/2 by 4 1/2-inch loaf pan. In a medium bowl, sift together the flour, salt and baking soda, and set aside. In the bowl of an electric mixer fitted with the paddle attachment, cream the butter and vanilla bean seeds on medium speed for 1 minute. Slowly add 1 cup of the sugar to the butter mixture and cream on medium speed for 4 minutes, and set aside. In a separate bowl, whip the eggs until they are frothy, about 1 minute on medium speed (I used a hand mixer, but if you have a second bowl for your electric mixer, you can use that too). Then slowly add the remaining sugar and beat for about 4 minutes, until light, fluffy, and lemon colored. With the electric mixer on medium speed, add half of the egg mixture to the butter mixture in 4 parts, mixing well after each addition. Then add the flour mixture in 3 parts, alternating with the remaining egg mixture (flour, egg, flour, egg, flour), mixing well after each addition. Add the heavy cream or sour cream and mix until incorporated. Transfer the batter to the prepared pan and use a rubber spatula or offset palette knife to smooth the top flat. Bake for about 1 hour and 10 minutes (mine took 1 hour and 20 minutes), until a knife inserted in center comes out clean. Tent the top of the cake with foil if it is browning too much after 50 minutes in the oven. Let the cake cool in the pan for 30 minutes, then turn it out and allow it to cool completely on a wire rack. Dust the top with confectioners sugar before serving. Makes 1 (8 1/2 by 4 1/2-inch) loaf. I would like to know if this cake can be frozen? I want to make 12 of these for Christmas gifts. 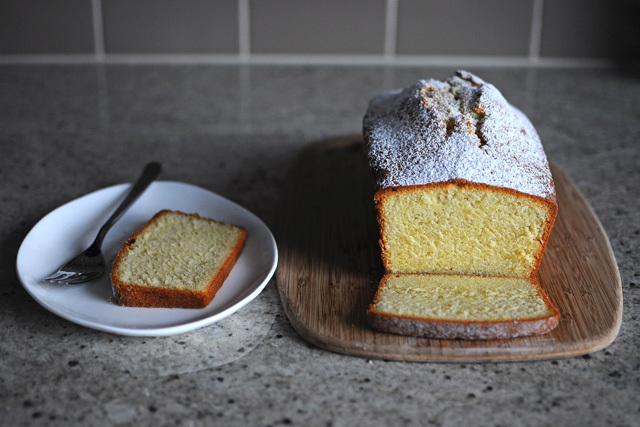 In general, pound cake does freeze well (if well wrapped, you can freeze it for up to 3 months). However, I have never frozen this particular pound cake recipe. If I were you, I would bake one, freeze it, and defrost it and see how you like the resulting cake before committing to handing them out for Christmas. I do predict that they would freeze beautifully though.